Morning everyone, I wanted to blog about my mini shipping trip yesterday because they where giving £5 Gift Card when you spent over £10. The Gift Cards are valid next week with a minimum spend of £10. What was even better for me was the fact I actually had a £10 gift card which I received last Saturday, it was part of a Bridesmaid Gift which I was kindly given along with a beautiful vintage style Butterfly Necklace from Accessorize. So off I went yesterday afternoon and picked up this very plain but stylish sleeveless fawn coloured top. I knew the colour and style I was after, because my mum bought me some palazzo pants and I wanted to get a plain coloured top as the trousers are the main feature with a pattern. The too was only £6.99 which is a real steal don't you think? Once I worked my way through the rails I saw a stash of these beautiful bold swallows which really caught my eye. I immediately pictured the necklace with the top and my palazzo pants. Mission complete. Then when I took my items to the till and handed over the gift card, I soon realised I had miscounted the items, oops. Top £6.99 + Necklace £3.99 = £10.98! I couldn't use my bank card as I didn't have it so opened up my very sad looking change compartment and literally emptied it out on the counter and I had exactly 98p how fricking spooky is that? It's so funny how things work out. Then once my items where bagged up I was handed the £5 gift card and well on my way, a very happy customer. Next stop was Topshop where I have been eyeing up their Highlighter Sunbeam. I first found out about this highlighter last year after reading Gh0stparties blog. Then soon found out they had stopped selling it :( boo hoo! However they're selling it again, yippee, so I had to pick one up. 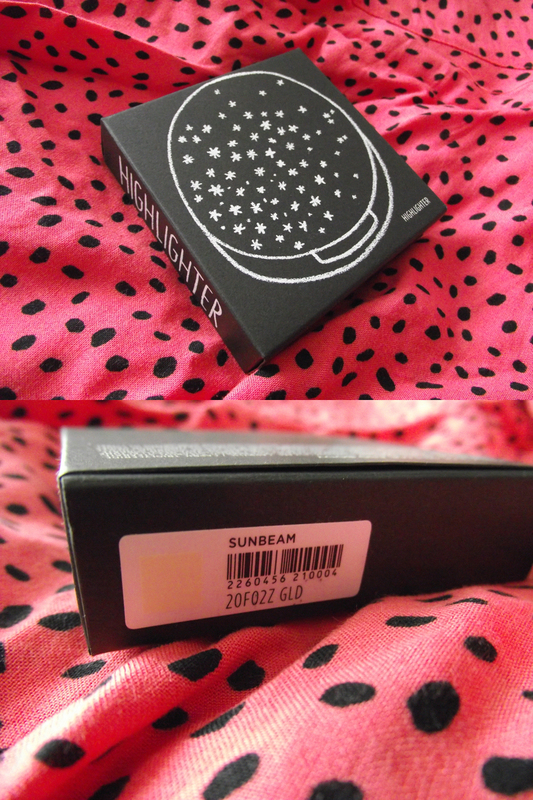 Upon swatching the tester I knew Sunbeam was coming home with me, this is totally different from any highlighter I have. Which to be fair is saying a lot because I am a highlighter fiend! I love the yellow gold highlight this gives. It's very pigmented and I would go as far to say this rivals my Mac Shimpagne. I wouldn't say this is a dupe what so ever but I can see me using this more! I will of course do a comparison.Another good point which I must say is cost, Sunbeam will set you back £10 which is very good value considering the amount of product you're getting. What have you been excited over recently? New top? New book? New product? I'd love to know! !